The day after I woke up a little groggy, given the fact that we had drunk a bit too much the night before. The weather was incredible. Neither hot, nor cold. Rome just before spring is a sight for sore eyes. After having breakfast – typical Italian breakfast with cornettos and cappuccino – much to Saeko’s delight, we went straight to the less touristy part of Trastevere, then to the Jewish ghetto, and finally off to the Colosseum. We walked for hours literally. 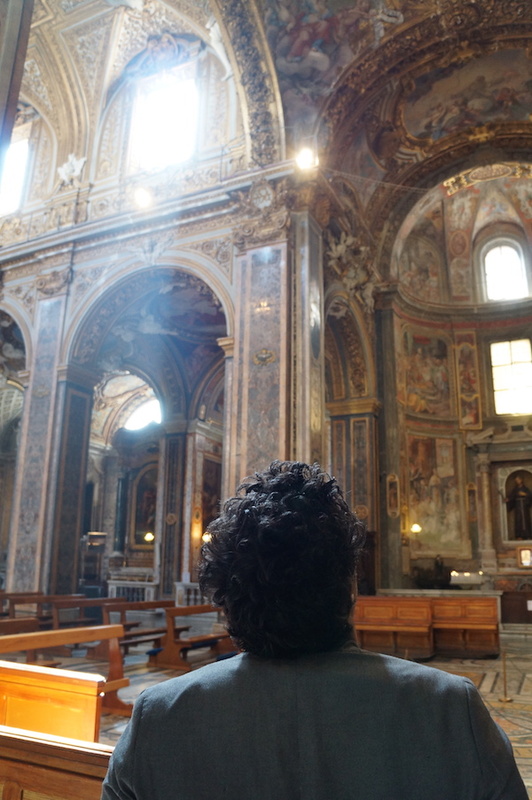 As soon as we arrived to Trastevere, I noticed a Church I had never been before, and we went inside. The Church is called Chiesa di Santa Maria dell’Orto. First, I was baffled by the fact that I had never been there, considering that it is rather close to where I live. It is not the first time that I find myself in a completely new place and I ask myself “how could I possibly have not seen this?” I am often amazed by the profound ignorance of my own city. I guess that, (like many other people), I take too many things for granted. I often discover new places (and/or notice details of others which I am supposed to know well) when I go around with a foreign friend. Second, foreign friends help me not only discover new places in my own city, but they also make me look at them with a new perspective. This was particularly evident in this situation. I was looking up in admiration at the vaults of the Church when Saeko uttered a “eeeeeh” – the Japanese love expressing surprise with just one vowel rising in pitch, which I find super funny – and waved at me. “Come here Luca san” – she said. I approached her. She pointed at a picture. It was indeed surprising. 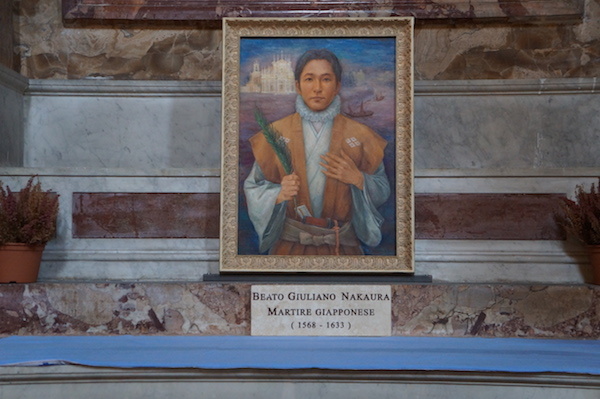 There was a chapel with a painting showing a Japanese guy holding an olive branch with his left hand. Now I was completely surprised, and even slightly amused by the the combination of my ignorance and by the weird twist of events. Visiting an incredibly beautiful Church next to my place which I had never seen, with my Japanese friend, and it so much happens that an entire chapel has been dedicated to a Japanese martyr! It immediately dawned on me that the fact that I was exploring the Church with Saeko make me look at it with a new perspective. If Saeko hadn’t been there, a chapel for a Japanese martyr might not have struck me as much, or might have simply not seen it. In a way, languages and people can change the angle at which you look at things, as much as a prism bends light and changes the perspective of what you see. It is amazing that every time I visit my own city (or another one for that matter) with a different native speaker, the experience adds new elements to my perspective. I’ve spent entire days going around Rome with friends from many countries and every time I discover new things about Rome from their perspective. Its architecture, churches, food, Roman’s attitude, public transportation, you name it. And you discover all this through a foreign language! The following day my friend Luca joined us. Luca and I have been very good friends since in 2011 he sent me a message through YouTube asking about my method and after I invited him to Paris to talk about it. It’s thanks to him that I got to know Saeko. 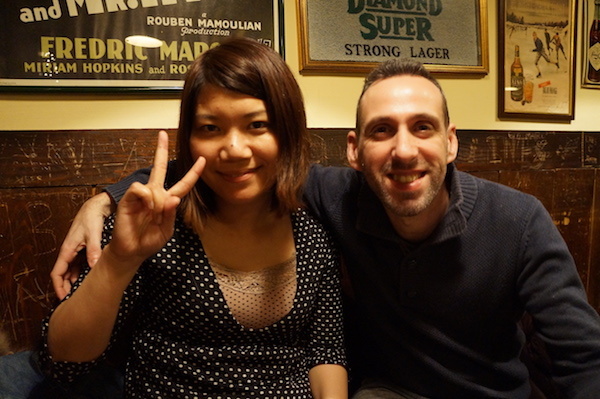 What struck me about Luca from the very first time we met has always been his gentleness and modesty, as well as his incredible mastery of Japanese. He wrote a very nice guest post article here about the mistakes to avoid when starting learning Japanese. Luca’s arrival changes the dynamics a little. Saeko and Luca started speaking a lot of Japanese together. Saeko started speaking faster with him. In fact, so fast that I had a hard time following the conversation. I am always surprised at how higher the bar suddenly gets when you move from speaking with a native speaker in a one-to-one situation to listening to 2 people speaking to each other at a native level. Although I had slipped into passive mode with them, I tried to participate in the conversation on and off, interjecting to say something, or asking Luca to explain what is going on if I got lost. In the end, having to sometimes listen to other people talk is normal, and I learn from it without letting myself get discouraged by the fact that I often got lost in the conversation or couldn’t say something as I would have liked to. We had 3 wonderful days together, walking everywhere, going to bars, seeing friends, visiting places, and above all, chatting, smiling, exchanging ideas. 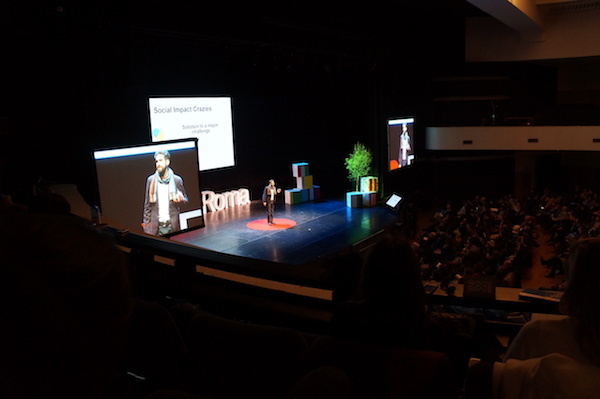 We went to TEDx Rome event together, and we listened to some very cool and moving speeches. ローマは気入りました – Roma wa KI NI^ hairimashita? which literally means did Rome go inside your ki (soul)? If you want to learn a language for real, that is, make it become part of your life, make sure you establish an emotional connection with its native speakers and their culture. The role feelings and human interaction plays in your success is crucial. You can expose yourself as much as you want to a given language; watching movies, TV series and listen to hours of the radio, and you will surely improve, but nothing beats human interaction if you want a language to be part of your life, or part of your soul or of your “ki” – as the Japanese call it. You need to find native speakers and interact with them. There are many ways. You can find them online first, and have an exchange on Skype for example. But even a regular contact with native speaker online is not enough if you want to take a language to the next level and start living the language in the real world. So, if you can, go visit a native speaker in their country, at least once. If you can’t, for say, economic reasons, ask them come to your place! People travel so much more nowadays has become cheaper and faster in general ( especially if you can provide a place to stay and a kitchen to prepare food). I always say – and will keep repeating it – that learning a language and expanding is not about hard work. It is about smart work, doing something every single day, taking things step by step. Ask and learn: asking is simple, fast, and doesn’t cost a thing. Being curious is key because the more curious you are the more you will learn. Don’t just ask one question and be content with the answer. Ask as many appropriate questions as you can. Learn how to ask questions. Asking questions is a great way to learn, but you also have to consider the person you are talking to. They might not be patient, and if you ask too many questions, they might get overwhelmed. So, learn to ask the right amount of questions. Choose the right time. Try to avoid asking the same question multiple times and try to do it in an entertaining way. Give. Be ready to give and not just take. Meeting a foreigner and spending time with him or her is an exchange. You don’t want it just to be just in your favour. Make sure that you are both learning and spending a good time. Whenever you can, explain aspects of your culture, food, language. it will make you feel good about yourself and the exchange you are having. “Sharing is living” – is what my Polish friend Michal likes saying all the time, and I agree. Get out of your comfort zone. Whenever you can, try to talk about things you can’t say, and if you don’t know the word, simply ask. Don’t be afraid of making mistakes, they are part of learning. Remember that the more you get out of your comfort zone, the more you will learn if you have the right attitude. Jot stuff down. Most of the things you learn on the fly will fade away if you don’t find a way to catch them. The best way is to write things down. Keep a small notebook with you at all times, and when you learn something, make sure you write it down. Change your approach if it doesn’t work. If your approach is not working in general, try to do something you have never done before. If for some reason you are talking to someone and you don’t learn much, maybe you should be looking for another partner. If you are just listening and reading and then find it difficult to speak, then find a native speaker and so on. The key is to be flexible and recognize that if you have chosen the wrong path, it doesn’t mean that you can’t find the right one. It is just a matter of searching and finding. Make corrections your best friends. Whenever someone corrects you, take the corrections as a chance to learn and refine your language. Make sure you tell her how much you want to improve. Any feedback you get in terms of grammar, pronunciation, or simply how and when to say certain things is gold for your learning journey. Finding someone who can give you feedback in a constructive way is key to make your language learning grown in a positive environment. Use what you learn. Part of being flexible is being e able to use what you learn to solidify it in your brain. So if you’ve learned something new one day, don’t hesitate to try to use it again some time later, maybe embedding it in another sentence. Start with simple sentences. Getting out of your comfort zone doesn’t necessarily mean that you start forming complicated sentences for the sake of it. Speak about topics you haven’t talked about yet in your target language, but you can do this by using short sentences. Remember to keep communication simple. This is how kids build their languages skills. They start with very short sentences and then they assemble them together to express more complex ideas. So, whenever you can, use simple sentences. This is one way of relying on your native tongue less when you’re trying to express yourself. At a later date, you can move on to forming more complex sentences. After all, complexity is the sum of many simple parts. Walking, jog, work out. You don’t just learn when you are sitting sitting down bent over a book, or talking to a person. You also learn when you interact with the environment. When we move, we tend to learn more, be it just walking, running, or engaging in other physical activity. By doing so, we get exposed to images, sounds, gestures, and countless situations which is great for learning. Language learning is a long path. Sometimes you get lost and you have to find your way to the path again. If something doesn’t work, try another approach. It is important to realize this when you are learning because it will save you a lot of time and energy. This is what happened to me with Japanese; at first, I wasn’t learning in a way that was efficient for me. Connect with native speakers. Meet up with them, in your country or theirs. Meeting Saeko was exactly what I needed. I had a fantastic time, I spoke a lot of Japanese in real life situations. I understood that living the language in real life is what I needed to take my Japanese to the next level. Look for a native speaker, make it happen. The way you end up learning depends only on you and choices you. “You are the books you read, the films you watch, the people you meet, the dreams you have, the conversations you engage in. You are every single day.